Le talentueux étudiant en architecture Clément Vives nous livre ci dessous une étude approfondie du travail des deux architectes Philip Johnson et John Burgee qui sont à l’origine du building de la Bank of America à Houston dans un style post moderne passionnant. Clément Vives , a talented student in architecture gives us here below an thorough insight into the work of the two architects Philip Johnson and John Burgee who designed the Bank of America Center in downtown Houston in a fascinating postmodern style. The Bank of America Center is located downtown Houston, Texas, bounded by Smith and Louisiana Streets, Rusk and Capitol Avenues.Designed by two well known architects in the United States, Philip Johnson and John Burgee created a building mixing the 17th century Dutch Renaissance architecture applied in a post-modern context. « It can appear alternately fanciful, energetic, and brooding — quite a range for a tall building in 1984. It could have been a little more than historic veneer applied to another dumb box. Instead it reminds one of the days when skyscrapers were a big deal », said Progressive Architecture magazine about the Bank of America Center. With his 1.25 million square foot, the building was completed in October 1983. Thus, it contains a banking hall, stores and a 56 story office tower, by a 770 foot hight. It is originally designed for Republic Bank and acquired by NCNB Texas in 1989. The whole building, interior and exterior is covered by Napoleon red granite which come from Europe. It detailed in a similar pattern of rustication, with square inserts and four-panelled widows up to the cornice line of the low building, while rising with its distinct shaft above. The shaft, alternating pilasters and mullions, create an A B A B A rhythm. The building occupies an entire city block, except for one corner, which is occupied by the Western Union equipment building, and which proved too costly and complicated to relocate. Instead, it was decided that the bank of America Center would completely hide the Western Union switching station inside. It now stands completely independent of the skyscraper that covers it. Thus, the planned approach is to divide the block into four quadrants. Along these cross axes, vaulted arcades run through the building, street to street. It is possible to do a distinction between two different parts. The first one concerns a low banking hall and the second one is the tall office tower. The banking hall is located in the quadrant adjacent to the switching station and extends above it. It composed by a series of monumental barrel vaults, by a 75 foot hight. That give a regard for this entrance and an identity at the street level. This hall allows the connection with the tower and the downtown Houston tunnel system. The major axis bisecting the block serves as an interior street, with four entrances. The arch continues through the complex as an interior street, which is air-conditioned, a highly desirable feature in Houston during the summer months. The banking hall itself has a 120 foot ceiling which steps up symmetrically in layer upon layer of granite ribs, with the skylights above filling the hall with daylight. 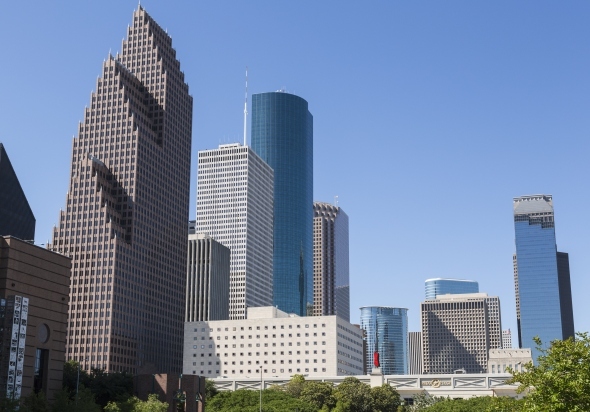 A monumental building in downtown Houston, clearly representative of a postmodern style, succeeding the modern style. The modern architecture is familiar. It is present in many cities worldwide. This is why it is considered as an « international style ».It is characterized by tall steel, concrete and glass buildings. It offers identical shapes whatever is the function: housing, offices, companies, prisons. Françoise Choay considers this style like « la réduction sémantique » («semantic reduction ») in 1967, the shapes become autonomous. Indeed, rationality dominates: straight lines, right-angles, raw material without any decoration and color. The glass significance responds to the problematic of the brightness. It is use for its physical dimension but also like a way of expressing and furthering the activities transparency. The interior building organization reflects its functionality. Distinct spaces are reserved for the 4 activities considered like a resume of the human existence: inhabit, work, enjoy and move. That brings to mono functional spaces separate each other and linked by circulation axes. The composition is clear and non ambiguous. It is otherwise with the postmodern architecture, witch takes shape at the end of the 20th century. Its main characteristic is eclecticism, all styles arbitration, all references, all periods. 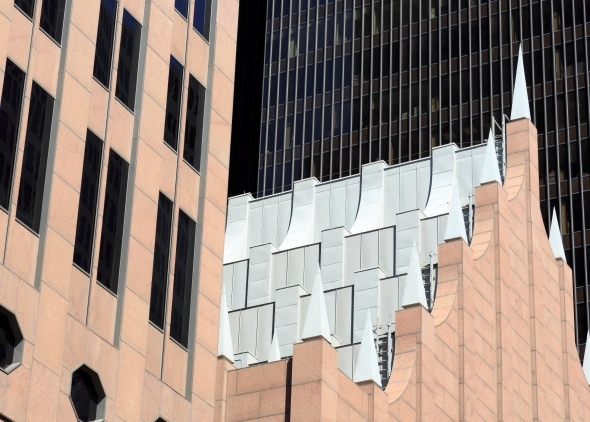 postmodernism rediscovers many architectural archetypes: arches, columns, pediments, slopping roofs, as it is suggested with the Bank of America Center. This style borrows as much from Renaissance architecture as modern architecture. It rediscovers a diversity of shapes, materials and architectural composition. Postmodern architecture like modern architecture adopts the truth of the materials, purity and shape rationality. Nevertheless, color and ornamentation are also present in the post-modern style, arousing emotion. The functional specialization of the spaces is abandoned for the benefit of a diversity. Modern architecture is familiar: it can be found in every city all around the world. This is why it is called the « international style ». Formed by tall steel, concrete and glass buildings, it offers identical shapes whatever the uses: housings, offices, companies, prisons, occupies undifferentiated towers and bars whose Choay stigmatized « la réduction sémantique » (« semantic reduction ») in 1967. The « large housing » replace houses and housings, « green spaces » parks and gardens and « driving routes » streets and boulevards (Choay, 1967). Rationality prevails with a preference for the orthogonality, straight angles and straight lines, whole materials without decorations and colors. This « purity » and « truth », as it is said, of the shapes, lines and materials are clearly required by the promoter of this architecture. From Loos who sees in the color only « daubing of criminals and mental degenerate », to Le Corbusier, for whom « the taste of the ornament sends back to the savage who still lives in us » . The important use of the glass has to answer to a clarity concern, which it is the question of understanding not only in its concrete physical dimension but also as way to express and to favor the transparency of the activities, to see the democratic functioning of these. The internal conception of these buildings also aims to be completely rational: every function has its own space and mutually . All which appears as directly and pragmatically useful is excluded. So, no cellar, no attic, described by Le Corbusier as places where we can accumulate things that we shall throw tomorrow. The internal feature of buildings send back to their organisation: different spaces are reserved for four activities considered as summarizing all the human existence, living, working, enjoying oneself and moving, which brings to the creation of monofunctional spaces, separate from each other as scattered islands and connected by axes, themselves ranked according to the type of uses and users. It is quite one different face that presents the postmodern architecture and town planning, appeared more or less in the last quarter of the twentieth century, even if there are diverse illustrations well before. The differentiation is the main characteristic of postmodernism and, with it, eclecticism, conciliation of all the styles, all references, all periods and local specificities. Thus postmodernism rediscovers numerous architectural archetypes like in the Bank of America Center of Houston: arches, columns, pediments, slopping roofs. It borrows just as much from the architecture of Palladio that in that of the « strip » of Las Vegas and does not make distinction between learned compositions and popular forms, sacred references and commercial inspiration. For that it has adopted the imperative of the truth of materials, of purity and rationality of the shapes which ordered modernism, the color and the ornament are valued here in the fact that they arouse emotion and refers to feelings. The functional specialization of spaces is abandoned for the benefit of a diversity: open internal spaces, multifunctional and infinitely « recomposables ». Non-separation of the functions but on the contrary interweaving and mixed, in particular places of residence, work and leisure activities. So it shows, for example, the recent construction of the car factory Volkswagen in the old town of Dresden, Germany. Circulating to do shopping or go to school or to work, the inhabitants can see the assembly lines and they can use the piano bar and the lecture halls, assist to concerts and visit exhibitions there. In the same valuation of the usage diversity, the new station of Lille-Europe in France, where the specific function of station harmonizes with a business center and services, a shopping mall, culture and leisure equipments, all designed in interaction with the quite close historic urban area. Postmodern architecture and town planning propose also a specific relationship to time and space. Where modernism heard to make a clean sweep of shapes of the past, considered unsuitable and not significant Postmodernism does not hesitate, quite the opposite, not only to keep and to protect old shapes but also to appropriate them. In this way, Bofill built, in Saint-Quentin-en-Yvelines, in France, a building on the aqueduct principle and, in Marne-la-Vallée, in France, a building which takes the shape of an amphitheater. But these forms borrowed from the past hide functions quite different that those whom they sent back originally because they both are social housing shelters. « Semantic Reduction » which Choay attributed to the modernism here takes another meaning because the shape does not send back any more to the function for which it was intended. As well as playing with time, Postmodernism cheats in a way with space. Turning the back on the universal uniformity of modern architecture, it rediscovers the diversity of forms, materials, compositions and association in particular places. Postmodern architecture and town planning testify of the globalization of the world.